Crop residues are an important category of lignocellulosic biomass, a renewable feedstock source for biobased energy and other products. In the Midwestern United States, corn stover is abundant and thus the most likely agricultural residue to be used for biobased industries. Currently, it is the primary feedstock choice of first generation cellulosic biorefineries, including POET-DSM’s Project Liberty and DuPont’s Cellulosic Ethanol plant, both in Iowa. Production of fuels and other products from biomass requires a year-round, continuous supply of feedstock; however, corn stover, like most crops, has a short annual harvest window. To ensure optimal quality, it is typically harvested within a one to two-month period, depending on weather conditions. Thus, for biobased industries to be successful, cost-effective storage of biomass that preserves quality is critical. Corn stover is typically harvested as large rectangular bales (3 x 4 x 8 feet), which enhances bulk density. In addition, these large bales have an edge over round ones due to the ease in safe handling and transportation of the large quantities of feedstock required for biobased industries. Storage of these rectangular corn stover bales varies depending upon moisture content of biomass during harvest and climatic factors. 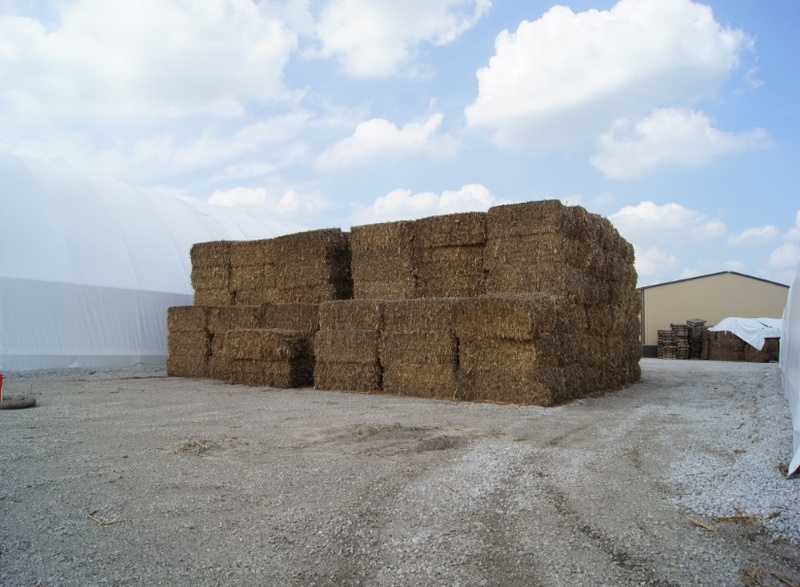 In the Midwest, typical options for storing stover bales for biobased industries include outdoors, either uncovered, with a tarp cover or wrapped in plastic, as well as indoors within a permanent structure, such as a hoop barn or metal building. Corn stover bales are usually stored in stacks six bales high with the exception of tube-wrapped storage. The different storage methods, including dry matter loss and cost considerations, are discussed below. Figure 1. Uncovered bales stored outdoors. In outdoor open storage, bales are stored without any protective covering (Figure 1). The top layer of bales is exposed to sun and rain, thus reducing the quality such that it does not meet requirements of biorefineries, and so, needs to be discarded. For the typical six bale-high storage stack, this unusable top layer results in a loss of about one-sixteenth of the dry matter. Biological activity in the other bales results in additional dry matter loss. Although this storage method has lower input costs than covered methods, there are costs associated with disposal of the top layer of bales as well as the high level of dry matter loss. These losses are equivalent to reducing the value of the feedstock by more than 17 percent. Its value is further decreased due to a reduction in the quality of the remaining feedstock caused by exposure to rain, snow and sun. Figure 2. Bales covered with a tarp and stored outdoors. In tarped storage systems, the stacked bales are covered with an ultraviolet-resistant polyethylene fabric, commonly known as a tarpaulin or “tarp” (Figure 2). 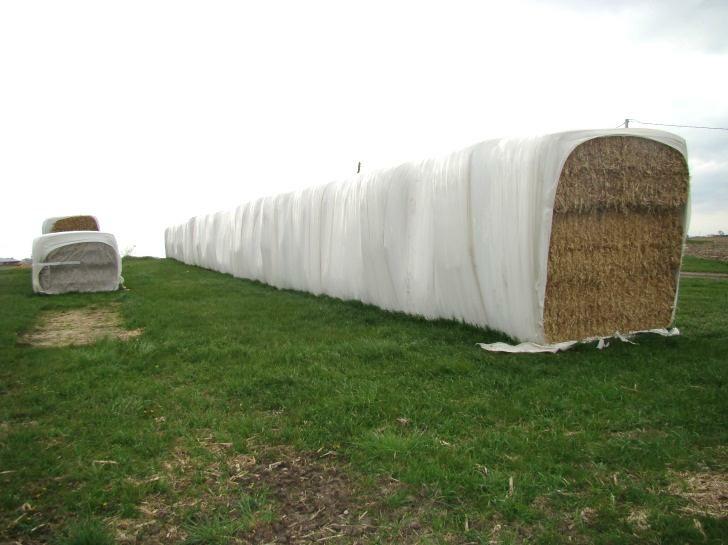 This covering helps protect feedstock quality by preventing water from dew, rain or snow from entering the stacked bales. It also helps minimize damage to the feedstock from sunlight, particularly ultraviolet radiation. This system preserves biomass quality at an acceptable range and reduces dry matter loss, helping to protect the value of the corn stover. The cost of the tarp is relatively low; however, there are some costs associated with handling and disposal of it. Figure 3. Bales wrapped in plastic and stored outdoors. In a tube-wrapped or anaerobic storage system, a long stack of bales is completely wrapped with five to 10 layers of plastic to limit feedstock exposure to oxygen, reducing the activity of aerobic microbes that cause most of the dry matter loss. Current, industrial-scale rectangular bale wrappers can accept stacks up to three bales high, which is different from conventional methods of wrapping individual bales and helps to reduce costs. This is a very common method for storing feedstocks with high moisture contents. Storage costs are comparable to those of tarped storage; however, disposal and/or recycling of the plastic can add significant costs. Figure 4. Bales stored indoors. 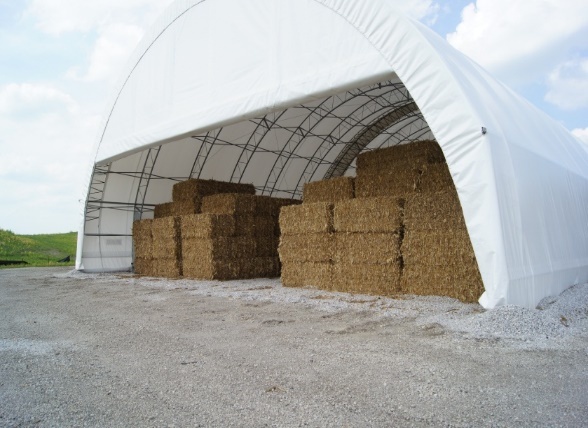 Corn stover bales can also be stored indoors within a permanent structure, typically a hoop barn or metal building. 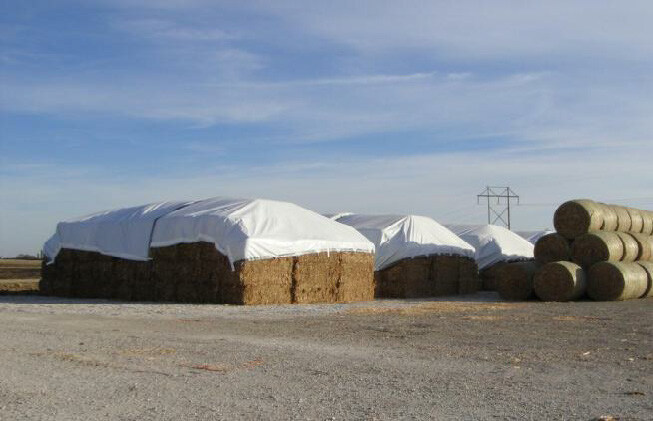 This method offers unique advantages over outdoor storage in that the quality of feedstock as a valuable resource for conversion to other high-value resources is maintained by reducing the possibility of water leaking into the stover bales. It also offers more protection to the ground surface, which allows for improved mobility and accessibility of the loading equipment used to transport the biomass. Regardless of its merits, this method has the highest initial cost due to the need to build structures; however, long-term economics are more favorable as the structure can be used for multiple years in contrast to the need to replace tarps every two to three years and plastic every year for outdoor covered storage systems. Which storage method should you choose? While storage of corn stover can help biorefineries optimize their feedstock supply, the best storage option may vary for different farms. Table 1 provides a summary of the relative merits of the factors to be considered when selecting a storage method. As the cost of harvesting and baling is the same for all methods, variations in the cost can be attributed to the purchase and handling of materials, such as tarps or plastic, or to capital costs of structures. Similarly, energy use for each method is primarily related to harvesting and baling, with the exception of the added energy and related cost of wrapping and handling a large volume of plastic for the tube-wrapped bales. Although permanent structure storage results in the least dry matter loss, the capital costs can be prohibitive. Thus, unless a building is already available, tarped storage is recommended as the best option. Table 1. Factors to consider when selecting a storage method. Much of the information presented in this fact sheet comes from the publication by Darr and Shah (2012). For additional and more detailed information on this topic, please see this research publication which is available online. Authors thank Dr. Erdal Ozkan, Professor, and Dr. Harold Keener, Professor Emeritus and Associate Chair, Department of Food, Agricultural and Biological Engineering, The Ohio State University for technical and editorial review of this factsheet. Darr, M.J. and Shah, A., 2012. Biomass storage: an update on industrial solutions for baled biomass feedstocks. Biofuels, 3(3), pp. 321-332.